I remember during my secondary school (high school) days I was already hooked on photography, but my family just didn’t have the finances to get me a proper SLR to pursue the hobby. I had an old hand-me-down Fujica 35-EE, the capability of which I quickly outgrew. It was fortunate that a classmate of mine had a then almost state-of-the-art Canon AE-1 with FD 50mm f/1.8 S.C., and about a year later he acquired a Tamron Adaptall-2 80-210mm f/3.8-4, and we shared many moments using that set doing all sorts of photography projects to satisfy our hobby needs. And during those days I had often dreamed out owning an SLR with some lenses, amongst which were Minolta SR-T101b, XD-7 and the corresponding MD Rokkors. Then early in my university days a friend bought Minolta XG-M with the MD 35-70mm f/3.5 Macro as the kit lens. I was envious. Still living on borrowed cameras (this time it was Minolta X-700, Tokina 35-70mm f/3.5 and 80-250mm f/4.5 or something like that). With photos taken with Sony A7. Minolta MD 35-70mm f/3.5 (non-macro version) after cleaning and servicing. 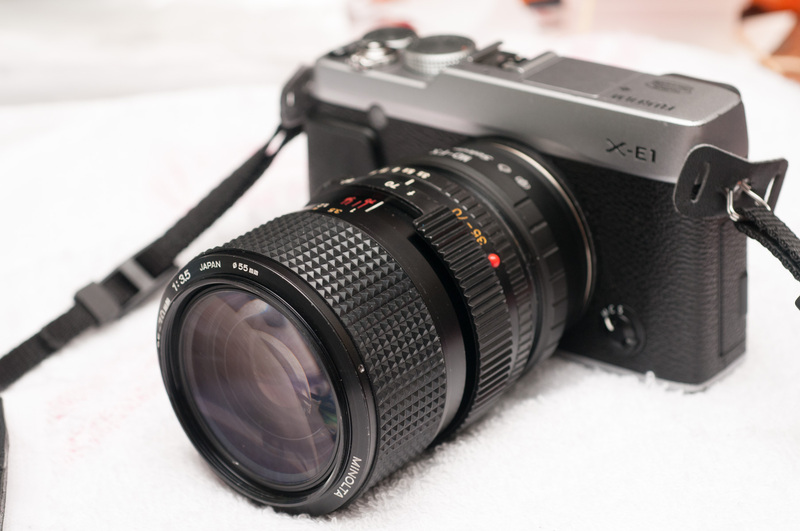 As I researched this lens, it appears that there are 3 versions of the f/3.5 (http://vintagelensreviews.com/vlr/reviews/minolta-md-zoom-rokkor-35-70-mm-f3-5-md-ii/). The more common version, to my mind is the second (without macro) and the third versions (with macro). The lens was made between 1978-1984, and was superseded with a variable aperture version f/3.5-4.8. In the realm of internet wisdom, some say the first version is clearly superior to the rest, others say the second version (without macro) is the best, still others say that the third is the best (often qualified due to the added flexibility of pseudo-macro). The second and third versions are identical except for the additional engineering that went into extending the lens to shoot macro. The variable aperture version, it seemed, is best forgotten. I don’t know… I had used the third version quite a bit in the mid 1980’s on a XG-M, that’s it. My present copy is the second version (without macro). My notes when purchasing the lens in February 2016: On the last day in Japan (17 Feb), I took a short trip to GoGo Camera, again to fish the junk pile (as well as to look through the normal range), to complete the SR-T101 set for display. There were MC 50/1.7, MD 28/2.8, and 2 MD 35-70/3.5 (both non-macro variant). Only 1 of the MD 35-70/3.5 was in “good enough” shape (but probably not for photo taking) to be kept. The prime lenses were in very bad shape. If you observe carefully, at 35mm the lens aperture is closed down a bit from wide open, just like the Nikon 36-72/3.5 E. My guess is that these two lenses if constructed today would be marketed as f/2.8-3.5. I had seen in some forums that this lens can be made into just that by removing some “aperture stop” but I have not figured out which stop and how. If I figure out I will write it in this post somewhere. It was a time when I had not started meddling with servicing lenses (or in other words, had not stumbled upon Richard Haw’s excellent write-ups), so the thought of servicing the lens hadn’t crossed my mind. My copy had fungus in it, and looked like it went through hell, but otherwise mechanically functional. At the start: absolutely filthy internals. It was made at a time when there was a strong collaboration between Leitz and Minolta, resulting in the Minolta XE-7 being re-made into Leica R3, the Minolta XD-7 into the Leica R-4, and probably into the R-5 as well. I followed the development through reading Modern Photography, but never once read about any Minolta lenses re-made into Leica R lenses. And I naturally assumed then that the collaboration was necessary for Leica to cut short development effort into electronics SLR, but lenses were Leitz’s forte. Today the internet is abuzz with legends that this MD 35-70mm f/3.5 was made into a Leica R lens (“A lot has been said about Minolta MD 35-70 f1:3.5 (leica)”), along with a few others. Naturally I am very skeptical… and I do not believe it is an el-cheapo Leica R lenses. Just like what some “Kiron Kid” claimed that Kiron made the Nikon Lens Series E 75-150mm f/3.5 (comments made at Thom Hogan’s review page: http://www.bythom.com/75150lens.htm); what a load of rubbish! The Kiron has a 13/9 design (Boggy’s website http://www.boggys.co.uk/page60.html), while the Nikon is 12/9 (Tale 42 of the Thousand and One Night, http://nikkor.com/story/0042/). I have disassembled the 75-150/3.5 E, and from what I can see within the lens, it is a Nikon thoroughbred. Mechanically very Nikon, albeit with more plastics. In several forums there were high praises for this lens, saying such things as “A Diamond in the crown of the Empire Minolta”, “Image quality is not worse than the lenses with fixed focal length lenses”, etc. My 2 cents? Prior to the present blog, I had some experience using this lens (macro version) with an XG-M in 1984/85 period, and it was very good – those days we could not pixel peep. Leica-good? I don’t know – never had the finances to try a Leica, and never believed that Leica (or Zeiss) is superior optically to Nikon or Minolta or Canon or Pentax. Clearly there are lemons in the Japanese lenses; many are built to budget, but my opinion on cost-no-object creations they are equal to the Germans, if not better. OK, shield up (against internet retaliation). Well, I was expecting Leica performance, and I wasn’t … disappointed? Well no, or so I think, as I have no way to benchmark against a real Leica. It is pretty good though. I had limited play time with it, partly due to the poor air quality in China when I took this lens along for a business trip, partly due to my dislike for use of EVF and manual focus. And Minolta MD lenses can never be adapted for Nikon use for anything more than macro. Pencil drawing by my daughter’s friend. Fujifilm X-E1, MD 35-70mm f/3.5. Propaganda, China. Fujifilm X-E1, MD 35-70mm f/3.5. Then in mid 2017 I purchased a Sony A7 and the manual focus with focus peaking was making a big change in the ease of use. And so the lens came back out for a day out. Singapore high rise living, Sony A7 and MD 35-70mm f/3.5. Processed in LR, selectively increased saturation. Serangoon station, Singapore Mass Rapid Transit (MRT). Sony A7 and MD 35-70mm f/3.5. The MRT used to be such a joy and pride to the nation, but between 2015-2017 there were (and as at August 2017, still have) such a lot of issues on reliability of service. Spectacles. Sony A7 and MD 35-70mm f/3.5. I would say that this is one swell lens, good in many ways, sharp, good contrast and colours. Is it as good as a prime lens? My take is that it is not. It is better than the current crop of budget kit zooms (mostly of f/3.5-5.6 variety), but not as good as the current professional f/2.8 or f/4 zoom lenses. And does not equal prime lenses starting from the multi-coated days, e.g. MC Rokkor-PF 50mm f/1.7. It definitely out-performed my Auto Rokkor-PF 55mm f/1.8, or my MC Rokkor-PF 58mm f/1.4 in sharpness, colour and contrast. But these lenses have different charms. But I seriously dislike the minimum focus distance of 1m (non-macro version), too long. In fact I am finding the 0.6m MFD for certain 50-58mm lenses to be too long as well, and prefer a MFD of 0.45m. For more photos and other opinions, see http://www.fredmiranda.com/forum/topic/1219102. Reference: (http://minolta.eazypix.de/lr/z35-70_3,5_md3/nmd_zoom35_70.html German copy of a lost Japanese webpage, of limited value). Optical design, 8 elements in 5 groups (or so I think). From front: E1 to E3 in front OU, E4 to E6 in mid OU, and E7 to E8 in rear OU. Two vertical lines with gap in center is the aperture. Expect to meet 2 helicoids, one for focusing (FH) and one for zooming actions. See my post on manual lens construction (https://diediemustdive.wordpress.com/2016/08/27/lens-repair-2-major-parts-of-a-lens-manual-focus/). And the general procedure is to come from the front till all the lens elements are dealt with, and then from the rear to clean the interior and the rear optical unit (OU). Locate the set screw (circled) on the front of the focusing ring (FR), remove with a precision screw driver. There is no need to remove the rubber grip to the FR, underneath it there is only access to the focusing stop bars. There after use a friction tool to unscrew the name plate. Something like a rubber sheet would do, and I used the sole of my shoe to loosen the name plate! The square marks a screw access hole on the zoom ring to a screw holding the index sleeve. Note: I did not have a Minolta MD rear cap to rest the lens on, so I attached it to a MD-FX apdater as I worked with the lens from the front. Below the name plate there is a shim held by 3 screws. These 3 screws hold the FR to the FH, and is used to adjust infinity focus. I marked the shim’s index mark position, remove the screws, and mark the FH’s index mark position. Removing the shim by a tweezer, the focusing ring can be lifted off but with a slight tilt towards you (with index mark facing you) to clear off the index sleeve stopper (post in front of the index mark in photo below). Carefully unscrew the FH/front OU from the inner helicoid – opposite direction to that of Nikon. Do it slowly and note the point of separation between the helicoid. Mark it so to know where the assembly alignment point is. See below (arrows mark helicoid alignment). The front retainer is held with adhesive – I hate adhesives – would need solvent and a nice tight grip to open the front OU retainer ring. On the rear side (facing the rear of lens – not shown) is a retainer ring with two slots for removal with lens spanner. I eventually failed to open the front retainer ring and settled for cleaning the exterior surface and the rear element. Good thing there wasn’t any fungus growth in the inaccessible elements. Inner view of the lens after the front OU is removed. Note the presence of a sheet baffle at the end of the helicoid. Attempt to remove the mid OU will result in the sheet baffle coming off – which happened to me – that would be difficult to return in place without disassembling the front helicoid (inner). Please resist the urge to remove the mid OU at this point! Look for the 3 screws holding the index sleeve; you will need to operate the zoom ring to reveal the 3 screws at different zoom settings. The third is hidden and is accessed through a hole on the zoom ring. Remove the screws, then slowly pull the index sleeve out. (Photo above – front OU/FH still in place) The zoom helicoid has several parts – the tube where the rollers can be seen, inner tube and finally the mid OU / aperture / rear OU assembly. The front OU goes forward while the rear OU goes backwards when zooming to 35mm. Roller visible above at 35mm is one of three rollers holding the inner FH. Zoom to 35mm (above photo), mark the orientation of the inner FH, and remove the 3 rollers while holding on to the inner FH cradle. Inner FH cradle and the 3 rollers. Proceed to remove the mid OU with lens spanner. Arrow marks forward direction. I could not find a way to get the elements off the casing, so I assumed they are encased and formed 1 group. The exteriors were cleaned, and no signs of interior fungal growth. From the rear, 4 screws hold the bayonet mount. Mark index point and remove 4 screws, then gently pull the bayonet mount off. Make sure the aperture ring is not pulled out together – there is a small ball bearing to provide the click stop. If you need to service this part (I didn’t need to), then you must remove the aperture ring carefully so as not to lose the ball bearing. After pulling out the bayonet ring, the rear OU can be seen. Two slots to remove the OU, the inner dimples for removing E8. Use lens spanner to remove the OU, then remove the retainer. E8 can be removed; mark orientation. E7 is not removable, so if you need to clean it you need to access the inner surface from the casing. Cleaning them both and my job is complete! Finally, I cleaned the mechanical parts, applied grease to the FH and reinstalled the lens, following much the reverse of the order above. It took me a good 5 months from the start to the end, mainly because when I started I didn’t have the knowledge nor the skill to carry out the disassembly and cleaning. The thing that really stopped me was getting the name plate off – I just didn’t apply enough downward force to grip the name plate onto a suitable surface. I tried a few kinds of surface but eventually the sole of my shoe was the friction tool to use. And since in the intervening time I had disassembled 2 other zoom lenses (Nikon 36-72/3.5 E and 75-150/3.5 E), I would have both the knowledge and the skill to service this lens. And the initial thoughts were to use this lens as the learning tool before I go over to the Nikon lenses. Ha. Proceeding cautiously, and with complete instruction, I say I can now complete the work in about 2.5 hours. Current cleaned state of the lens… not perfect, but I am satisfied. Very useful, thanks. I was wondering whether you gave up on the lens because you didn’t get what you really wanted from it? Secondly, if (and it is a BIG if) the fungus seemed to be only on the cluster closest to the film/sensor, is it realistic to strip down just from the back to get the rear OU out and clean it? Thank you Brian for visiting and commenting. And thank you for your kind compliment. I gave up simply because of the difficulty in MF using the Fujifilm X-E1. This is probably going to change when I get my Sony A7 (one of the variants); after trying I found the Sony A7 to offer good focus peaking and should do much better, although there may be challenges in very bright or dim light levels. I will be able to tell if I can get what I really want from it (Leica on the cheap?) when I get the Sony. And yes you are correct to say that it is possible to get the rear OU out and clean just that. But I was on a learning journey to strip down lenses, so I went almost all the way to learn the tricks. And hope that this write-up will help others venturing forth. At some stage in the future I may again open up the lens and further explore the mechanics of it, which I found beautiful! Thanks. I did make some amendments to the blog after getting my Sony A7.